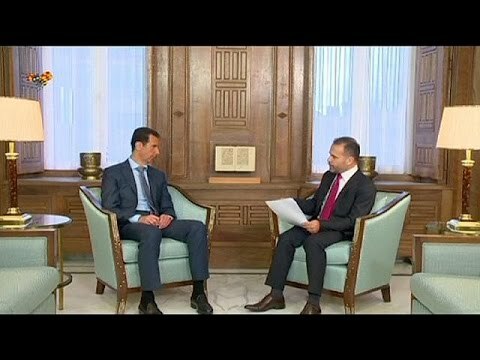 BETHLEHEM (Ma’an) — The Syrian regime no longer has any relationship with former ally Hamas and will never trust the movement again, Syrian President Bashar Assad said in an interview published Friday. Hamas fighters, along with other Palestinian factions, have been fighting IS militants inside the Palestinian refugee camp since Apr. 1, when the extremist group first launched an attack. Contrary to Assad’s claims, Palestinian officials have accused al-Nusra Front of facilitating IS’s entrance into Yarmouk. Al-Nusra and IS are largely rivals, despite sharing a similar ideology, but there have been instances of local cooperation between fighters from the two movements. Before the IS attack, Syrian rebel groups had been holding positions inside the camp for more than a year with some support from Palestinian residents, although it is not clear whether these rebels included elements of al-Nusra Front. Syrian regime forces laid siege to the camp as a result of the rebel presence, and up to 200 Palestinians starved to death as conditions inside the camp sharply deteriorated. The siege has continued to trap 18,000 civilians, even as Palestinian factions coordinate military action with the Syrian regime against IS inside the camp. Yarmouk was once a thriving, working-class residential district of the Syrian capital, and was home to some 160,000 people. Hamas fighters are among a range of Palestinian factions fighting IS inside the camp, although Fatah and the Democratic Front for the Liberation have shunned military action, citing the Palestine Liberation Organisation’s longstanding policy of non-intervention in foreign nations. Before the Syrian uprising erupted in March 2011, Hamas and the Syrian regime enjoyed close ties. Hamas used to keep its main headquarters outside Gaza in Damascus, and the Hamas delegation is believed to have comprised hundreds of officials. He said that the “good faith of Damascus” had done much to maintain the integrity of the Palestinian cause. However, as the Syrian regime violently suppressed popular protests through the second half of 2011, Hamas gradually scaled down its presence in Syria, and dozens of Hamas members and their families returned to Gaza. The rift between Hamas and the Syrian regime widened when Hamas opted not to sign a statement by nine other Palestinian groups, including the PLO, in support of the Syrian leader. At the time, analysts said that the public abandonment of Assad cast questions over Hamas’ future ties with Iran, which had until then been a major backer of the movement, and which stuck by its ally Assad. Although Iranian support did initially flag, it has since been revived, particularly in the wake of last summer’s devastating war between Israel and Hamas, which killed more than 2,200 Palestinians and left large swathes of the Gaza Strip in ruin. Iranian Foreign Minister Mohammad Javad Zarif rallied support and humanitarian aid for Palestinians, and earlier this month, it was reported by British media that Iran was again providing Hamas with tens of millions of dollars.